Hello, everyone! Hope you had a fun-filled Labor Day weekend! 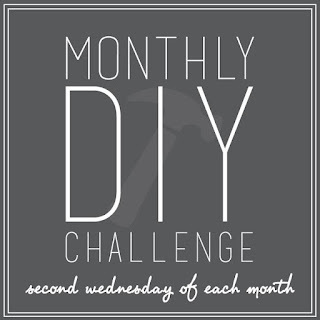 It's time for the Monthly DIY Challenge again! If you haven't heard about the challenge before, each month some of my crafty friends and I pick a challenge item or material to create something out of. I absolutely love seeing how many different ways we come up with to use the same items! It's so much fun! You can see our previous projects here or search for #monthlyDIYchallenge on Instagram! 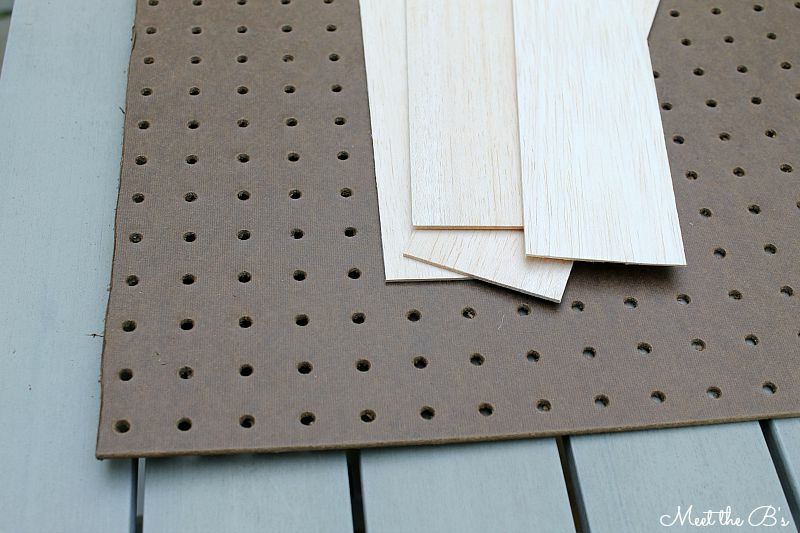 This month's challenge material was pegboards! I was actually pretty excited about this because we have two huge sheets of pegboard that have been sitting in our garage for over a year now! This didn't use up much of it, but at least some of it has been put to use!!! I've had an awful jewelry situation in our walk-in closet for a while now... as in my necklaces have been sitting in a gift bag all tangled up, so I get too frustrated to actually try to wear them! Now was the perfect opportunity to make my jewelry organized and accessible! 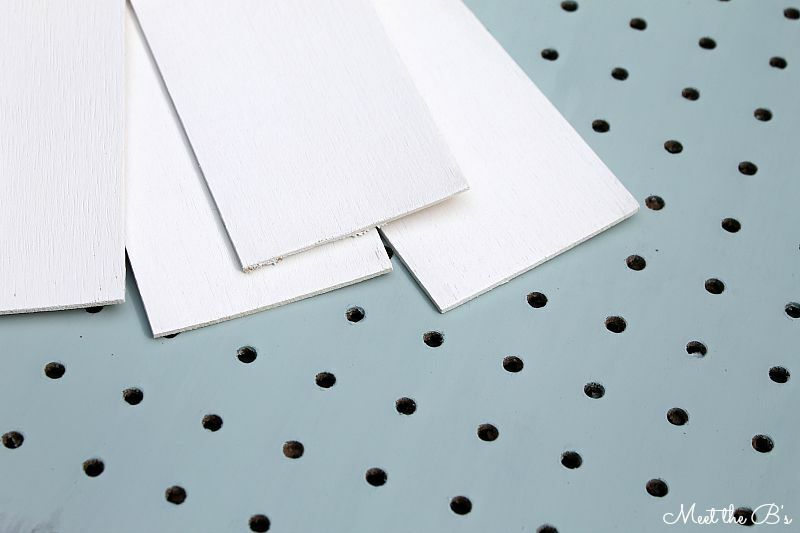 I measured the space on the wall in the closet, and my husband helped me cut a sheet of pegboard to size. It was actually fairly simple to cut using a straight edge and a box knife. I decided to frame it out with strips of balsa wood. 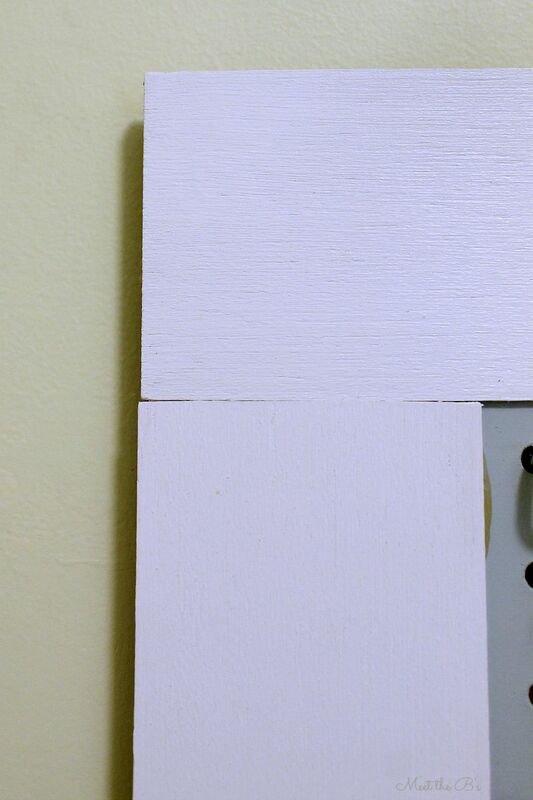 Balsa wood is super thin, so it's easy to work with and doesn't add much weight to your project. I painted the pegboard with chalkboard paint (Americana Decor's Chalky Finish* in "vintage") and the balsa with some white trim paint I had laying around. Then, I used wood glue* to attach my balsa wood frame. I wanted a "shaker style" look, so I just put the ends right up next to each other without needing any complicated angled cuts. Somehow I forgot to take a picture of this step, so I tried to crop a close up corner shot for you to see... I probably forgot because this step looked somewhat ridiculous during the process :-D Once I applied wood glue to the back to the back of the balsa wood, I found that my wood clamps were too strong for it and were causing indentations, so I piled on lots of text books and hand weights to keep the pieces flat until dry. It was beautiful. 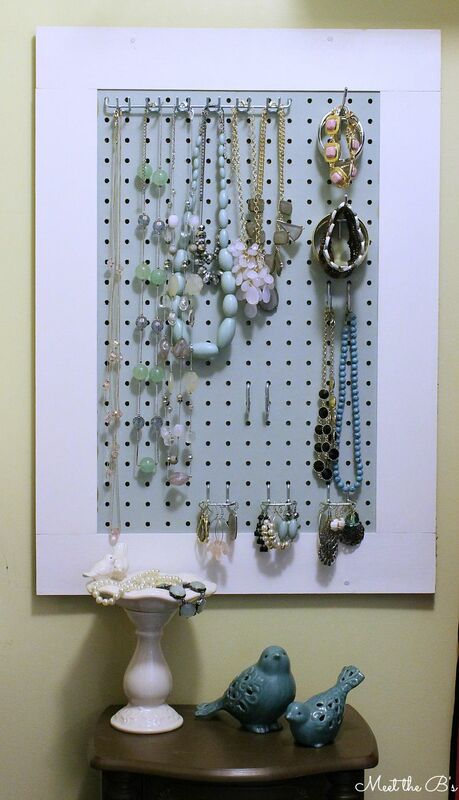 Then my husband helped me hang my new jewelry board in the closet. 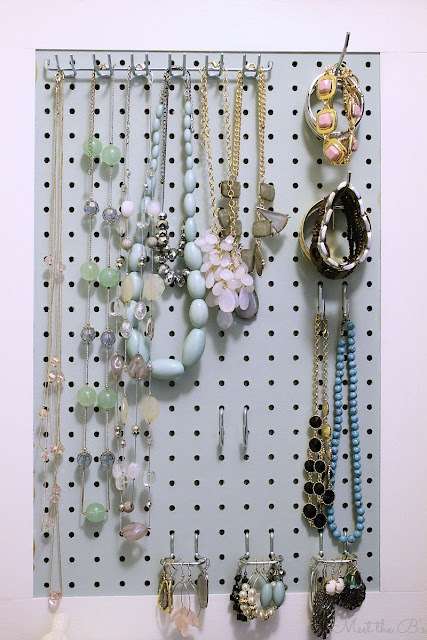 I arranged some pegboard hooks (I'm really happy with this kit* I ordered) and got to work organizing my jewelry. 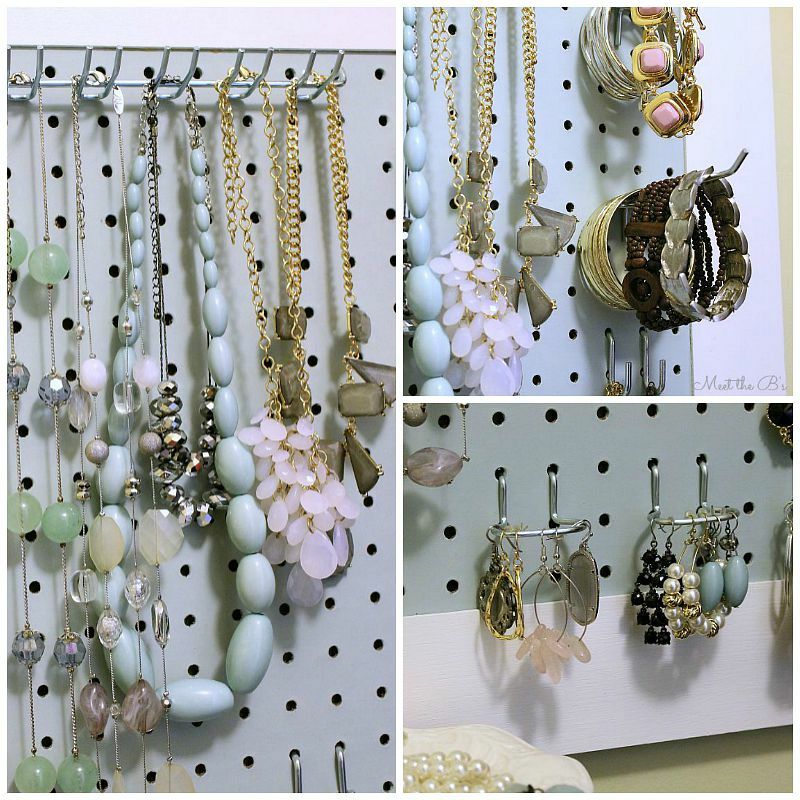 There are hooks that work perfectly for necklaces, bracelets, and dangling earrings! I still need to find a way to store my stud earrings, but I am so happy be able to see all of my jewelry and have it easily accessible! Want more pegboard fun? 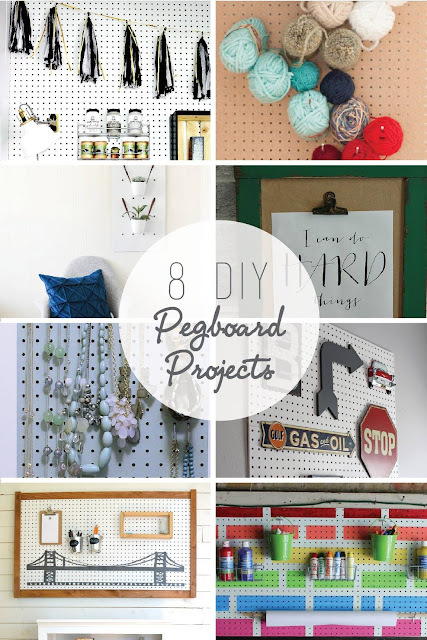 Check out seven more pegboard projects below! *This post contains affiliate links. Please see my disclosure policy. I was completely distracted by all your gorgeous jewelry! I just might have to stop over and borrow some :) Seriously though, this is really cute and the perfect organizing accessory for your closet. Cute project, Nicole! I'm glad you'll be able to be all glamified before baby arrives, now that you have easy access to your jewels!! This is seriously so pretty! What a great way to add some jewelry storage - I especially love the little dangly earrings all in a row! Such a great idea, Nicole! All your jewelry looks so pretty hanging up and looks like a piece of art!